Testimonials from an array of former University of Mississippi students who graduated with a B.A. in philosophy. 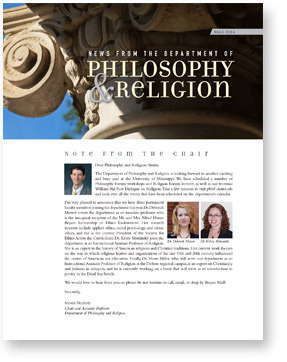 “The study of Philosophy has helped immensely in both of my primary vocations. The first of those vocations is as mother to our four children. From the time a then-three-year old asked, “I know that God made the trees and the animals and all of the things, but who made God?” to my now eleven-year-old’s interest in logical fallacies, especially those committed by her father and me, I have relied extensively on my ability to think clearly and quickly, a skill developed patiently by my University of Mississippi philosophy professors. Formerly with the the District Attorney’s Office for the Third Circuit Court of Mississippi. Currently practicing law in Southaven, Mississippi. “My philosophy degree helped me stand out from the sea of Biology and Biochemistry majors while I was applying to medical school. It showed that I had a different set of passions and wasn’t afraid to deviate from the default path. Admissions committees seem to love adding some variety to their incoming class. Now that I’m actually going through medical school, philosophy helps me on several levels. First, it definitely made me a more organized thinker. When tackling monstrous amounts of information on a daily basis, it very much helps to have practice on methodically working through convoluted information (or arguments). Philosophy trains you to be both big-picture and detail oriented: you must be able to follow complex theories and piece them together to form the ultimate conclusion, while also ruthlessly looking out for that one error in the argument that makes it all come crashing down. In medical school classes, this combination of skills has allowed me to excel, since I am accustomed to paying attention to both the big picture and the finicky details. formerly professor of English at California State University-Long Beach; currently administrative dean of the Honors College at Rutgers University. “My philosophy education has provided an enduring foundation for my entire professional life, and in ways that I could have scarcely imagined when I started the course of study over 35 years ago. The study of the great philosophical works, systems of thought and philosophy’s various branches broadened my perspectives and thinking far beyond any narrow parochial field or interest, so as to allow me to approach both my work and life in ways that drive towards deeper meaning, understanding and awareness. In my professional work of city planning and building human communities, philosophical discipline has served me very well in developing the skills of analyzing, understanding and diagnosing the fundamental dynamics and issues that communities universally face. How shall resources (land, investment, natural resources, etc.) best be allocated? Who shall participate in the decisions related thereto? For whose benefit shall the decisions be made? How shall suffering be mitigated by community effort? To what degree is it even possible? These are just of few questions that must be considered at an abstract level and answered with practical solutions applied in community. Aristotle himself was keenly aware of the relationship of such questions of virtue and the physical community setting in which they are to be considered. “The City,” he said in Politics (and I paraphrase), “should be built with eye to four considerations: health, beauty, convenience, and defense. The most important of these is health”. He then went on to set forth his philosophy of the city. Countless other philosophers have developed their own conceptions of the ideal human community and its systems, both sociological and functional. If I have been able to contribute anything to the betterment of human communities over the years as a professional city planner, I cannot imagine having been able to do so as effectively in the absence of the underpinnings of a philosophical education. The study of philosophy is of intrinsic worth. It should be pursued for its own sake. Yet as a framework for additional professional study and practice, it is exceptional preparation. I am thankful for it and indebted to the professors who have dedicated their lives to teaching its various expressions. Specifically, Dr. Shepard, Dr. Lawhead and Dr. Harrington from my years at Ole Miss come to mind. “The decision to pursue a philosophy degree from the University of Mississippi was easy. Previously, I had completed my first undergraduate degree in psychology. The glass had not been filled. I took my first philosophy class and was immediately hooked. I began to realize that philosophy is not only incredibly interesting in all of its forms, it serves as a universal foundation for wading through life. The skills I gained from all of the amazing professors in the Philosophy department have served me in both my everyday life and my career. They taught me to solve complex problems with efficiency and logic. As a project manager for a technology firm, I am responsible for organizing website, social media, digital advertising, and client relationship management (CRM) projects. Many of my CRM projects require intense sessions of data manipulation and breakdowns. The manipulation and breakdown of data often requires use of logic functions to complete – something I would not have expected to use in my career almost a decade later. “Prior to joining Forman Watkins, I clerked for Judge Rhesa Barksdale on the U.S. Court of Appeals for the Fifth Circuit. In fact, my co-clerk (Aaron Graham) is now in the Master’s program in Philosophy at the University of Mississippi. “Studying philosophy made me a disciplined thinker. I think of my job as identifying legal solutions for my clients’ business problems. Breaking down a specific problem into its constituent parts, identifying where the thorns are likely to arise, and planning for them. Because of my background in philosophy, particularly with professors who required you to show your work at each step through the progression of developing an argument for a position, I’m good at this. Keep in touch! We’d love to hear from you with news and updates. Send your updates to Neil Manson (namanson@olemiss.edu) and we’ll add them to this webpage. We also encourage you to “like” our Facebook page, Philosophy at the University of Mississippi.